As summer approaches, we are drawn to the outdoors, whether for a day at the beach, a few hours on the golf course, an afternoon at the swimming pool, or a tropical vacation for a week in the sun. 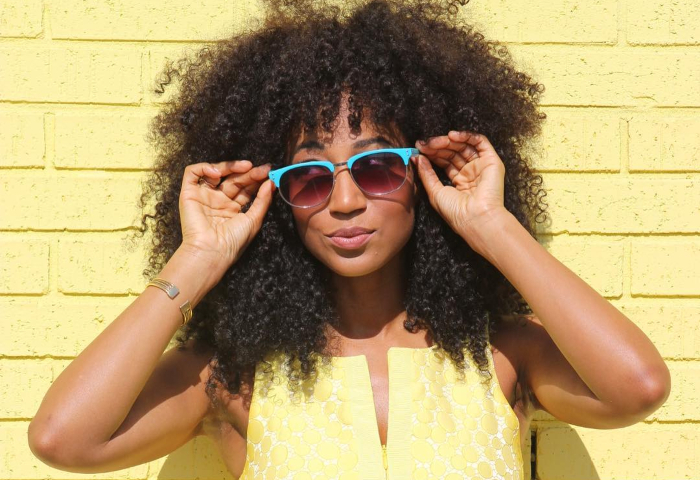 We all know the dangers of sunlight to our skin, and most of us take plenty of precautions to protect ourselves from those harmful UV rays when engaged in these types of outdoor activities, but what do we do to protect our hair? You may wonder why our hair needs any sun protection at all. After all, it is dead already, is it not? You might also have heard that sunscreen is important for the hair, but may be confused about why it is important or what to look for in a product. Here's some insight into the importance of protecting our hair from the damaging rays of the sun. Most of us are familiar with the lightening of our hair that occurs when we spend hours in the sun in the summer. To many people this is even a desirable side effect of sunbathing. However, this effect is evidence of the destruction of pigment in the hair as a direct result of UV-induced oxidation of melanin particles in the cortex. This effect is particularly devastating for those of us who rely upon the wonders of hair dye to enhance our natural coloring, because the molecules used in hair dyes to add color to hair are even more susceptible to degradation via ultraviolet radiation. UV radiation also can cause cleavage of molecular bonds in the hair, ultimately leading to fracture of the cuticle and the cortex. This can lead to dry, brittle hair, rough texture from damaged cuticles, split ends, and breakage. The solution is fairly simple. We can wear a hat or scarf every day, which really may not be an acceptable solution for everyone, or we can use products that contain sunscreen in order to give our hair the same protection we give our skin. These products are highly effective in the prevention of color fading, especially if the products are used daily, and protect hair from incidental sun damage that accumulates when going about our normal routines. In fact, it was the development of products with the goal of color preservation that led to the recent boom of formulas that contain UV absorbers in them. There are many new products available that contain sunscreens, including shampoos, rinse-off conditioners, leave-in conditioners and styling products. UVA? UVB? – What in the world? Ultraviolet radiation is a small a portion of the entire spectrum of electromagnetic radiation. We are surrounded by all types of electromagnetic radiation in our daily lives. Other parts of the spectrum are the gamma ray and x-ray regions, visible light range, infrared, microwave, and radio waves. Each region occupies a specific range of wavelengths or energy in the spectrum. Ultraviolet radiation (UV) occupies the wavelength range (320-400 nanometers) directly adjacent to visible light (400-700 nanometers), with smaller wavelength and higher energy than visible light. The higher the energy of a wave, the greater potential it has to interact with and react with our fragile human bodies. This is why so much caution is exercised when we encounter x-rays in medical testing. Fortunately UV rays are more easily combated than x-rays, which is why we don’t have to wear lead suits when we go to the beach. The UV range is typically broken into two regions: UVA and UVB. UVB comprises a narrow band with wavelengths from 280-320 nanometers and is typically associated with causing sunburns. UVA is a broader range, from 320-400 nanometers. These lower energy waves are thought to be the source of much of the aging caused by the sun. What ingredients do the trick? There are several types of ingredients that can help prevent sun damage to the hair and skin. The two recognized classes for sun protection ingredients are UV-absorbers and UV-blockers. UV blockers work by physically blocking the UV rays from the skin or hair. They are effective across the entire UV spectrum and are non-toxic and non-irritating to the skin. However, the trait that gives them their ability to function in the sunscreen capacity also tends to make them appear rather opaque and white in application. This renders them highly undesirable in hair care applications, as they would make the hair appear dull and lifeless. Work has been done and is being done to overcome this obstacle, but for now UV-absorbers are the ingredient of choice for most hair care products. UV-absorbers are typically organic compounds that contain conjugated double bonds (usually aromatic rings) and oxygen-containing carbonyl groups. Most of these molecules function by absorbing the energy from UV radiation ,which puts them into an elevated energetic state. They then undergo what is known as a vibrational relaxation transition which returns them to their normal, ground state. They can then absorb more photo-energy. This allows the sunscreen molecule to remain effective for a long period of time. Some other UV-absorbers actually undergo a reaction which eventually renders them ineffective as sunscreens. However, they provide very high levels of initial protection from the sun’s harmful rays, and are thus useful for short outings. An example of this is avobenzone. Most UV-absorbers function really well in either the UVA or UVB region, but not in both. For this reason many are used in combination with one another in formulations designed to provide the best coverage against damage from the sun. There have also been some new developments of polymeric UV-absorbers designed especially for hair care products (Solamer, by Nalco). The exact nature of these polymers is still proprietary, but one can assume they contain multiple sites for UV-absorption through the mechanism described earlier in this article. The multiple sites for UV-absorption make these polymers highly effective in hair care products. The manufacturer also claims excellent water solubility of the polymer while maintaining that it will be substantive to the hair when applied. In conclusion, we have learned the importance of protecting our hair from the damaging rays of the sun. Many newer products have UV-absorbing ingredients in them, so choices are becoming more widely available. Check near the bottom of the ingredients list for some of the molecules listed above, try some product on your hair, and go out and enjoy the summer! Keep in mind that many of the sunscreen additives are water-soluble, so it is advisable to reapply protection to your hair periodically if participating in water sports. This article was originally published in 2015 and was updated in 2018.